Welcome fall and celebrate Fair Trade Month with these Pumpkin Spice Brownie Snack Cups – layered with chocolate studded brownie pieces and fluffy pumpkin spiced cream – so easy yet impressive, so they are perfect for when you’re hosting guests! Disclaimer: This post is sponsored by Fair Trade USA, but opinions are always my own. I fully support the Fair Trade organization and try to purchase as many fair trade products as possible for my family. October is one of my favorite months of the year – the busy summer season is over and we can actually take a break from all the craziness and just relax with friends and family, catching up on life. It’s also considered Fair Trade Month and one I’ve supported for the past three years alongside Fair Trade USA, creating recipes using fair trade products: Coconut Mocha Frappe, Double Coconut Chocolate Cookies, Ultimate Triple Chocolate Brownies, and Mocha Cinnamon Rolls. 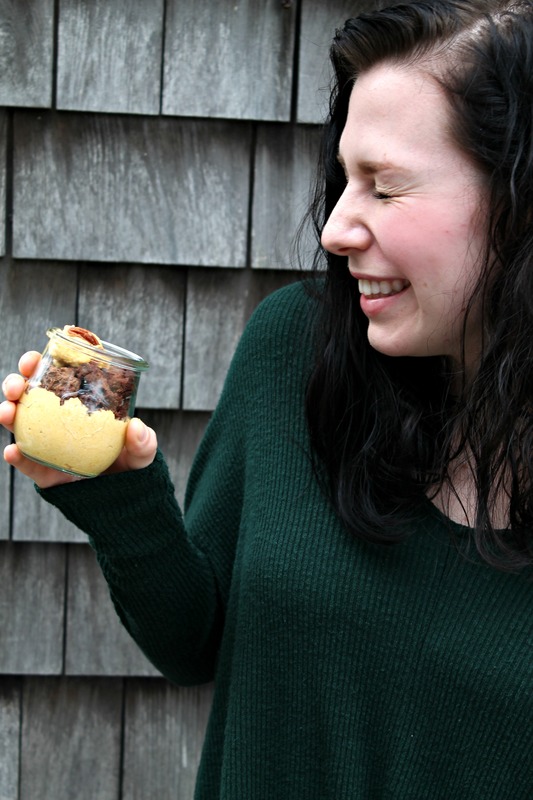 And as you can see with my model Sarah, it’s also fun to eat fair trade goodies! 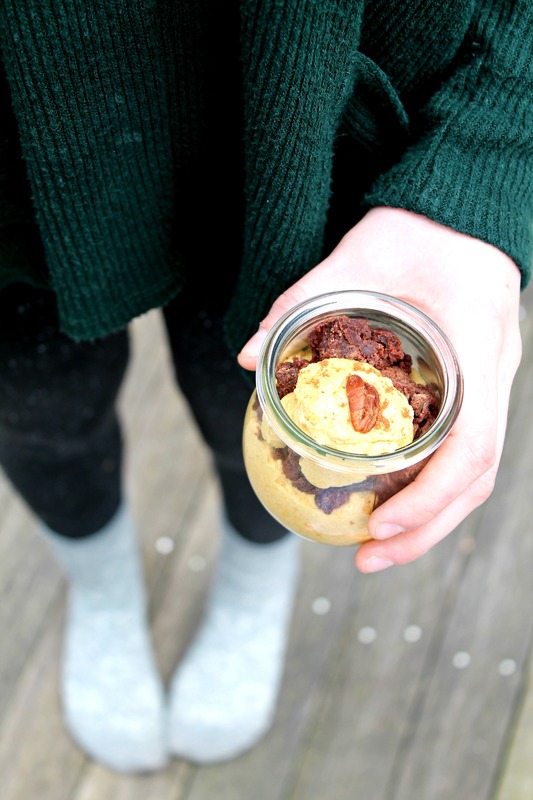 Pumpkin Spice Brownie Snack Cups are such an easy dessert to put together but if you’re hosting a dinner, they are perfect to make because they come together so quickly and look incredibly cute in glass jars. For this recipe, I used Sunspire chocolate bars chopped and sprinkled on top of the Immaculate Baking Brownie Mix before I baked them. Then, to layer, I folded whipped cream with pumpkin puree and Frontier Organic Ceylon Cinnamon. All your favorite fall flavors in one! Big changes can come from small, everyday decisions. Each moment offers an opportunity to build strong families, support education for children, protect the environment, and more. That’s why Fair Trade USA is running a special campaign called “Fair Moments” this October. Its goal is to show how everyday moments can have a worldwide impact when you choose Fair Trade products. See how your #FairMoments add up by going to FairMoments.org, and show us the difference you’re making in your own #FairMoments photos! These snack cups are super easy to make and look impressive enough to serve at a party! Make the brownie mix per instructions and add spices. Spread in pan and top with chocolate chunks. Bake until done and cool. Fold the pumpkin puree with cinnamon and whipped cream. Layer cream with brownie chunks in small glass jars and serve immediately. 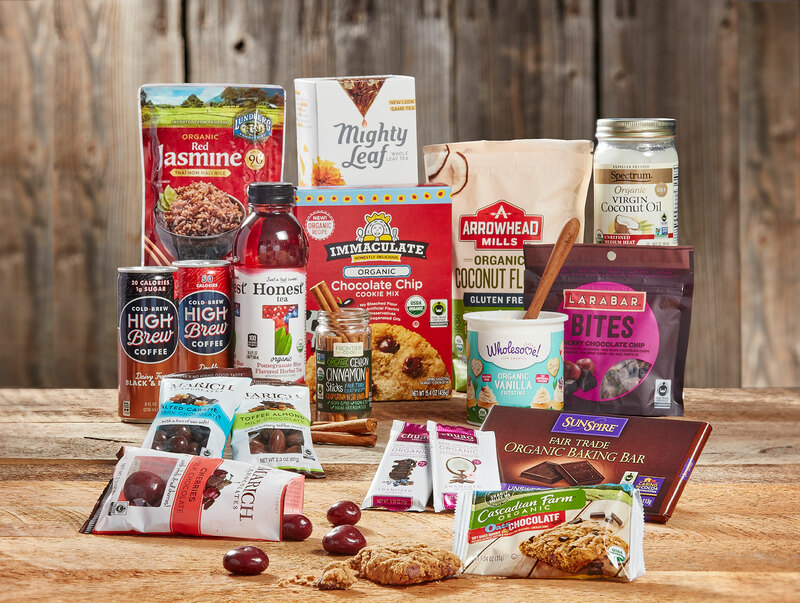 Try this recipe at home – and in the meantime, make sure to enter to win this incredible prize pack filled with Fair Trade goodies from generous companies – you’ll get everything below to create your own Fair Trade inspired recipes! And a huge thanks to Fair Trade USA for leading this movement – one I am proud to be a part of. I would start with with a nice cup of coffee and think about what to do next. I love fair trade products! I would make the chocolate chip cookies and have them with some High Brew coffee. I would make coconut cookie bars. I would make pumpkin, chocolate chip cookie bars. I would make a wonderful picnic basket and find a sunny spot to have a picnic! Nice time of year to have new baking supplies to try out! They all look yummy. I would make some coconut chocolate brownies with a bit of the cold brew!